Are you thinking about purchasing QuickBooks but unsure whether you can fit within the product’s limits? Not sure what those limits are? Are you a QuickBooks users wondering when your company will hit the limitations build into the Intuit accounting system? Luckily Intuit publishes the limitations of QuickBooks Pro on their website so that you can review them ahead of time to decide whether your company will fit into the capabilities of QuickBooks Pro. First, consider that overall QuickBooks is designed for companies with under 20 employees and less than 2 million dollars of annual revenues. That doesn’t mean it won’t work for larger companies. It only means that the typical QuickBooks users are within these parameters. Companies that are expecting to grow beyond these capabilities might consider starting with a more robust accounting system to avoid a migration as the company grows. QuickBooks is designed for small businesses with 20 or fewer employees and annual revenue of less than two million dollars. The ideal use of QuickBooks is to keep at least two years of detailed transactions in a company data file so that you can run comparative reports and have prior-year project information. The rate of growth of QuickBooks company data files varies significantly from company to company. There is no “average” or “typical” data file size, since businesses track different information. How quickly a file grows depends on the number of transactions, the amount of information entered per transaction, and the number of “links” per transaction. One reason that Intuit talks about file size limitations is that many existing QuickBooks users could find reporting and speed of data entry gets much slower as the data files grow. 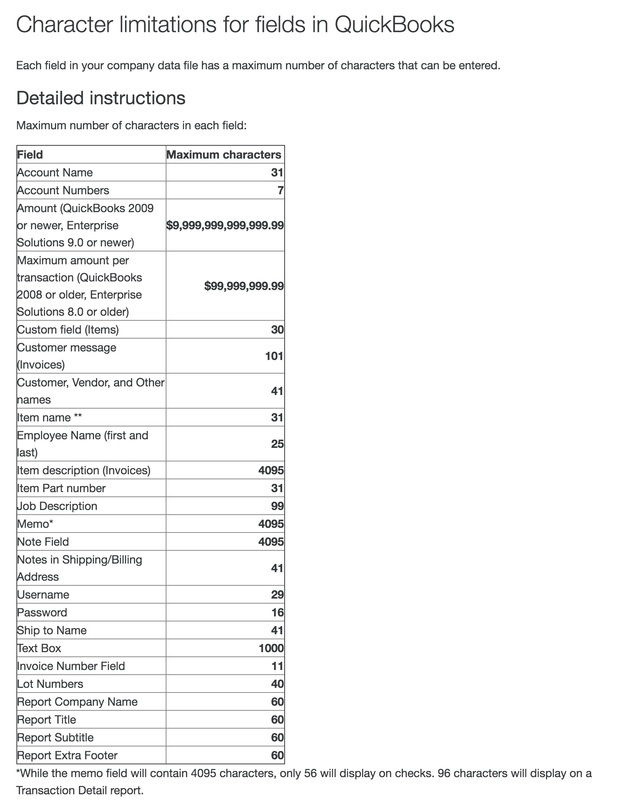 Here is a list of the limitations of field sizes within QuickBooks. The main issue with these limits could be the account number size which is restricted to only 7 characters. 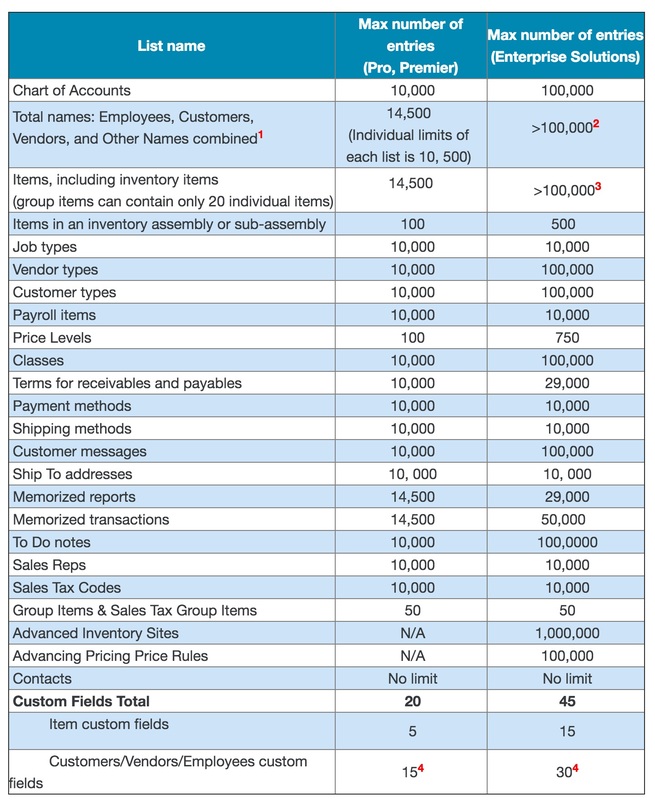 Here is another Intuit QuickBooks chart showing the limits on numbers of records. Note that while you may have up to 10,500 employees, vendors and customers individually, combined they cannot exceed 14,500 or you’ll be forced to migrate. Inventory limits may seem robust however growing companies – especially wholesale distributors – often carry a broad catalog of items from multiple suppliers. These items can easily grow to exceed 14,500. Inventory limits may seem robust however growing companies – especially wholesale distributors – often carry a broad catalog of items from multiple suppliers. These items can easily grow to exceed 14,500. Unfortunately, too many companies don’t consider these hard limitations before investing hours of labor into using QuickBooks for their statup. If your company can fit within QuickBooks and you do not expect to grow within the next 5 years then you’re probably on the right path if you are investigating QuickBooks as an option. If your company expects to grow past $2 million in revenues or will deal with more significant inventory capabilities and pricing then consider skipping the entry-level QuickBooks Pro and looking at alternatives. Your goal should be to avoid a migration in the future just as your company is growing rapidly and can least afford to interrupt their business processes. To speak with us here at Schulz Consulting and discuss ways in which Sage 100 might be a better fit for your company, please use our contact form. Someone will call or email within 2 hours to discuss any questions. This morning I received a somewhat confusing email from my local Paychex representative. The subject line of “QuickBooks May Be Discontinued” caught my attention. 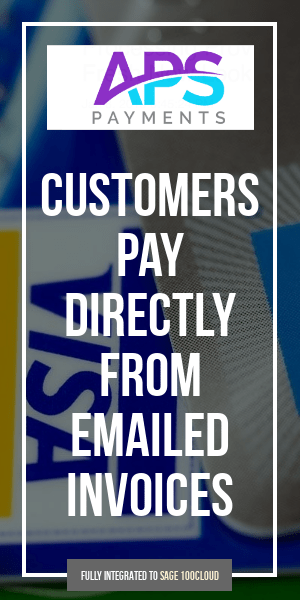 There was no message in the body of the email, however, attached was a graphic (see below) that stated QuickPayroll was being discontinued. Sensing that something wasn’t right and that there’s no way that QuickBooks was going to be discontinued I contacted Intuit for their feedback. As it turns out the notification, sent by my local Paychex representative, was only partially correct. 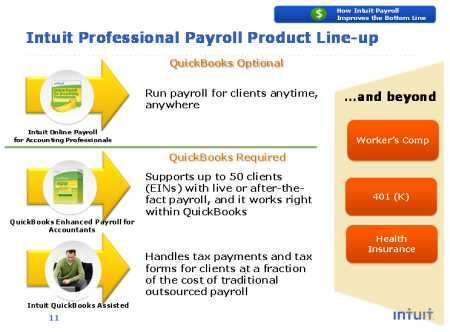 QuickBooks Payroll is not being phased out. An older low-end version product called QuickPayroll is being discontinued in favor of any of Intuit’s other three payroll processing options. With over 1.2 million payroll customers there’s a slim chance that Intuit’s going to turn their back on the payroll market. In July of 2009 Intuit actually increased their presence in the payroll market with a $170 million acquisition of Paycycle which also brought 85,000 additional small business payrolls under their arm. Intuit Online Payroll – cloud-computing payroll service that runs stand-alone or integrates with QuickBooks desktop and QuickBooks Online. 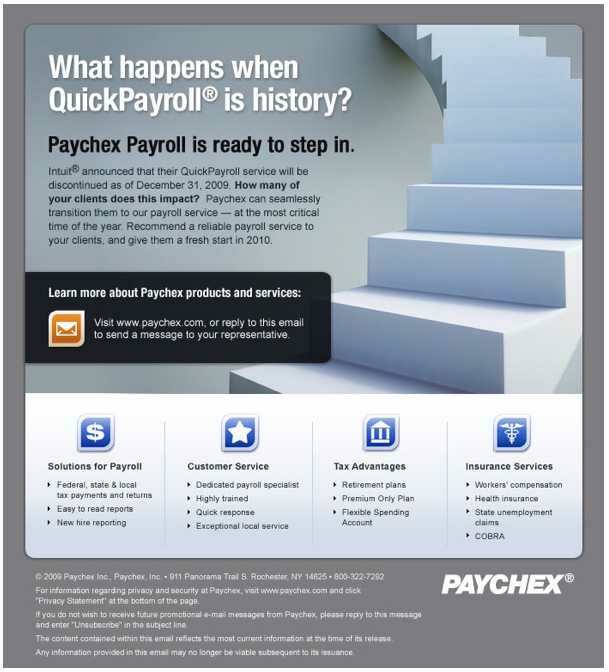 So rest assured that QuickBooks and QuickBooks Payroll are both alive and well. 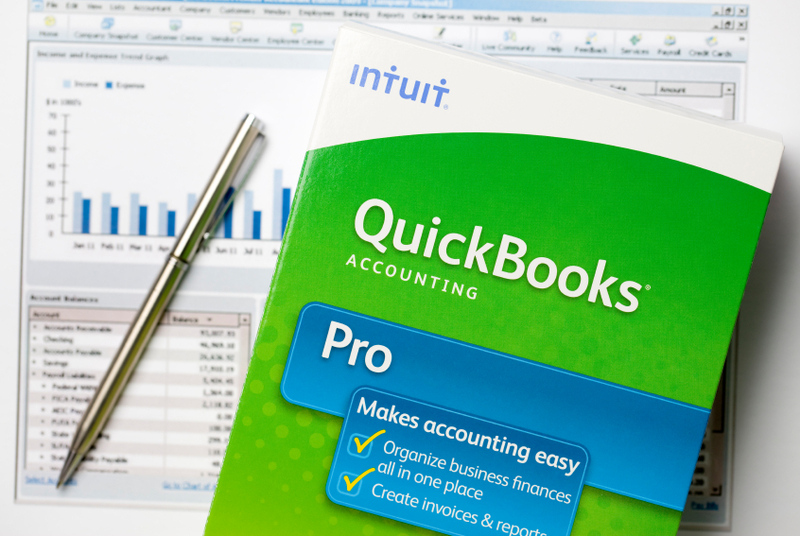 While we don’t offer services on the Intuit product we wanted to provide this update for any users who might have received the same type of email with mis-information about the status of QuickBooks Payroll. Intuit in a blog posting today announced the long awaited Quicken for Mac would be available for pre-order in October 2009 with final delivery scheduled for February 2010. First due out in 2008 as Quicken Financial Life for Mac, the software release schedule has gradually slipped. Intuit spent the time working with beta testers and when they found areas that needed improvement rather than release the Mac product they continued to refine it. Feedback from Mac customers led us to rethink our approach to developing Quicken for Mac. We went back to the drawing board and are making changes to everything from what the program does to how it looks. We spent extra time building a reconcile mode for the new register, a robust Windows-to-Mac transfer function for new Mac users (and existing customers running Quicken on a Windows virtual machine), and redesigned the experience to make it look and feel like a native Mac application should. We understand our loyal Mac customers are disappointed that the product won’t be in stores until after the first of the year. For that, we apologize. We think taking our time to get it right will be well worth it and will make Mac customers even more excited when they use the new Quicken for Mac early next year.